We think there’s a bit of an unsung hero in Harry Potter land. Sure, Dumbledore is wise and Sirius is edgy; Hagrid is big-hearted and Dobby is adorable. But Minerva McGonagall has something none of these other folks have--Dame Maggie Smith playing her in a movie. No, seriously, aside from that, McGonagall is fiercely loyal, finely trained, and a ferocious opponent of the forces of evil. 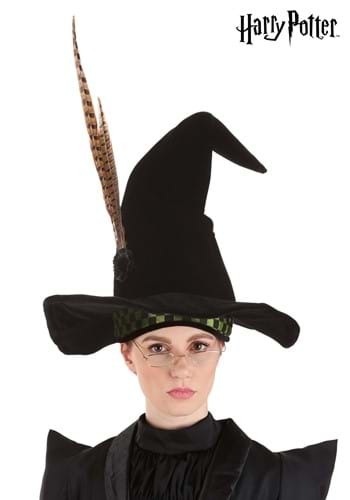 Now you can become the (inarguably) best witch in the wizarding world, the (inarguably) best head of house, and the (inarguably) best Transfiguration professor out there just by donning this McGonagall Hat. With its internal size adjuster, this feathered cap can turn anyone into the seemingly cold bit deeply caring lady of Hogwarts castle, regardless of the size of their noggin. Sadly, however, this hat cannot turn you into a black cat; you’ll need to study hard to be able to do that!